Is fulfillment-by-Amazon (FBA) profitable for you? Or should you choose FBM for your Amazon products? What can the Amazon FBA calculator do for you? Calculate every Amazon selling fee for any product with the Amazon FBA fee calculator. might have the answers for you. How to use the Free Amazon FBA calculator? ASIN is the 10-digit unique identifier associated with every product on Amazon. Every Amazon Seller calculates his profits before and after launching his product on Amazon. For a profitable Amazon business, you’ll have to do a bit of research and calculations on your initial investments, cost price, marketing and other variable things like estimated sales, etc to understand your profits and profit margins.Let’s take a closer look and understand your Amazon Selling process and costs better. Amazon FBM requires a firm hand on your selling responsibilities to manage things smoothly as well as make profits. Shipments and customer service must be well handled. 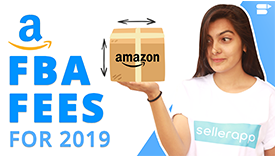 Since FBA sellers get a better advantage over FBM sellers you might also have to lower your selling price to compete against FBA sellers with similar products to get the BuyBox advantage. Amazon FBA isn’t free. It can eat up your profit margin if you don't calculate it right for the products you sell using FBA. FBA charges include fees for Order handling, Pick & pack, Outbound shipping, Weight handling, 30-day storage, Inbound shipping, Prep service. What is the Amazon FBA and the Amazon FBM? How to use the Amazon FBA calculator? How to find the seller profits in the Amazon FBA profit calculator? What are the cons of using FBA? We believe the Amazon FBA Calculator is pretty great, But don’t just take our word for it….